This is the look I give the mom when I want her to get off the computer and feed me. Do you know that despite this glaring look, I still had to wait 15 minutes for her to do that??? She kept saying… “Just give me a minute or two, Wally.” Totally unacceptable! If this look isn’t gonna work for me, I’ll have to come up with something better. How do you guys get your humans to do what you want them to? Dang, that’s a long time to wait Wally! We just sit and stare like you do and sometimes we end up waiting too. Wow, you maybe you need to stare harder or closer to her face? Anny wait is TOOOOO long! Try jumping on tables or counters, Wally. Maybe even knock things over. Some humans need a lot of motivation to get moving. I find the whapping paw and piercing Meowlll of Demand to be effective. – Toby. If I could, I would show you last nights picture of me with MY look. 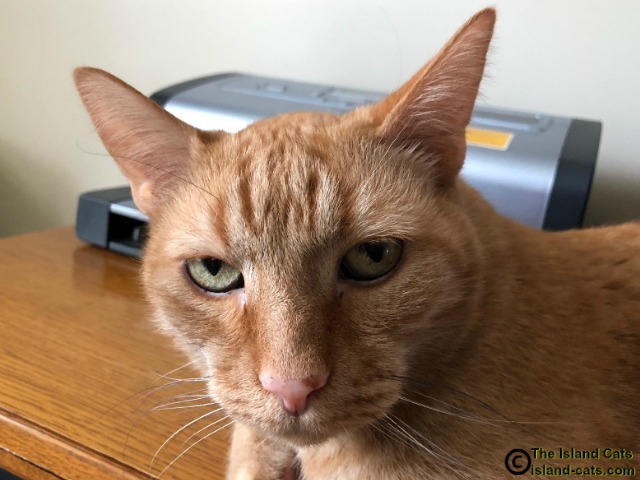 But if that doesn’t;t work, I pace and pace and pace and…..
Wally, Chili Bruce makes a plaintive cry/meow that breaks my heart, and he’ll also put his front paws on my leg…which works EVERY TIME! Whoa! I can sympathize with you. I hear “Just another minute” for about a half hour before she finally comes. There’s a tiny cat tree near the desk and sometimes I have t jump up to make her notice me. I don’t know how you can make your servants do your bidding. They are very unreliable. Harrison meows incessantly until he is fed. Maybe you need to be a little louder! Food time! Well, we all have out own devices for food. Budd simply yells his head off. No break or pause, Yelling till breakie and din din show up. Tyebe joins Budd in the yelling department. She also runs frantically across the counter. I sit and stare like you Wally. We must’ve learned this at Cat Scouts. The stink eye works pretty well and if it doesn’t, one of Budd’s or Tyebe’s antics will. Rosie gives me this look, too! Though sometimes she also meows and walks across the keyboard. I think your look is perfect! Oh my! You’ve got that look DOWN Wally! MOL! That is a darn good look Wally. We always just wind ourselves around the Mom’s feet so she has no choice but to feed us just to get us out of the way. Hope the Mom comes up with some food soon. LOL I bet that look works quite well 🙂 Niko comes to me with purr storm and whole body pressing when he wants me to get him food. It works very well as well! Samantha lets out pitiful sounding meows until her meals are served! Allie jumps on Mom’s desk and starts knocking things off! If that doesn’t work, she paws at the monitor. Good luck. Mudpie glares too…and I don’t always jump into action fast enough! Running back and forth over the keyboard or getting behind the PC and messing with the cables usually works! Wally I must say that that withering stare looks a lot like the one Amarula loves to give me! Mom minutes. Pfft. We have them here, too. Humans are hard to train. Wow, that’s one seriously hard look, Wally! Binga says to just bite her on the nose. I try to sit on her and talk at her too. A well-placed claw in the back of her heel. Applied with some force. Gosh Wally – “the look” works for me – maybe you do need to add a little “flourish” to yours? Purrrhaps the baring of a fang? Purrrrhaps a “bored yawn”? And last but not least – a small upchuck might serve you well. You need to expand your repertoire of maneuvers. Wally, the Mom tells mes, “Just a minute, Carmine, and I’ll feed you,” all the time. But then, guess what?? Hers does other things for like 20 minutes before hers feeds mes!! Sometimes I gotta meow at hers and sit on the warm laptop so hers will stop messing around and tend to the important duty of feeding mes! diego-san has found howling at the top of his lungs may not speed up the feeding process but is cathartic nonetheless. OMG Wally! That look in your face it’s exactly the same my cat gives me when he wants something. I’m sorry you had to wait 15 minutes. That’s way too long! Meow meow Wally mee tried sittin on thee laptop ON LadyMew’ss lap…that did not werk. So mee doess a little pace back an forth an then mee eatss a few kibbellss an throwss sum around….LadyMew ‘hopss’ to it an mee getss food! Trainin takess time mee frend…. Wow, that’s quite a look Wally. I can’t believe your Mom made you wait for food. I sit quietly in front of my empty food dish and guilt my humans into feeding me. It always works. Bentley starts whining ten minutes before dinner and Pierre hangs with him so they can double-dog team me. I think your look should work though.